Ryan Homes, Wayne Harbin Builder, Inc. 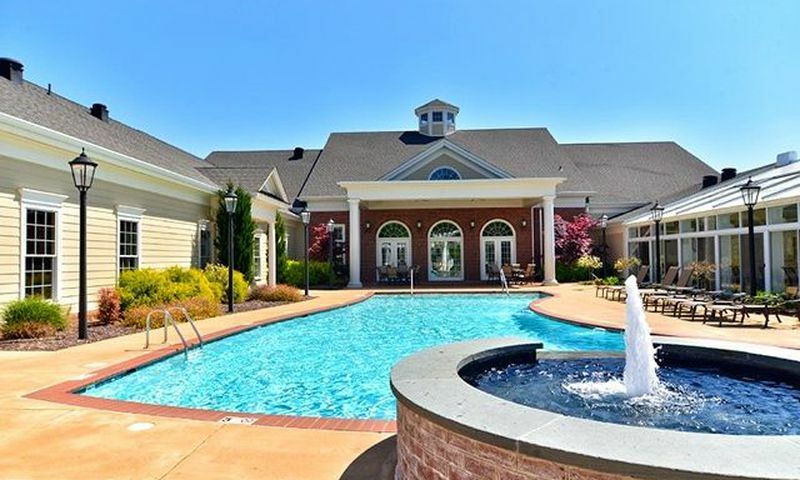 The Settlement at Powhatan Creek is a beautiful 55+ community located in Williamsburg, Virginia. This gorgeously developed community is located next to the fresh waters of the historic Powhatan Creek. Residents aged 55 and better enjoy living in low-maintenance homes without having to give up size, modern style, and convenience. Homebuyers can choose from townhomes to spacious single-family homes on a new and resale basis. In addition, The Settlement at Powhatan Creek offers top-notch amenities and a lifestyle coveted by most. The Resident's Club is a 15,000 square-foot clubhouse available exclusively to the residents of The Settlement at Powhatan Creek. This state-of-the-art amenity center features an indoor and outdoor pool, tennis court, ballroom, game room, catering kitchen, and fitness and aerobics room. The stunning clubhouse s amenities continue with multi-purpose rooms, locker rooms with showers, and an Internet caf . Residents can even reserve clubhouse space for special events and occasions. Outside of this magnificent clubhouse residents can take full advantage of attractive walking trails found near the community or simply take in the scenic views of the pond at the gazebo. The Settlement at Powhatan Creek opened in 2008 and upon completion the community will encompass approximately 400 homes. Homes built by Wayne Harbin are offered on a resale basis. These single-family homes and townhomes all feature main-level living with master suites on the first floor. They also feature at least two bedrooms, two bathrooms, and an attached garage. Ryan Homes offers homes on a new construction basis. Homebuyers can choose from a townhome or single-family home that features at least three bedrooms, two bathrooms, and an attached two-car garage. The Settlement s homeowner s association collects a reasonable monthly fee that handles all outdoor maintenance including lawn care of homes and common areas so you have time to enjoy life to the fullest. There is always something exciting happening at The Settlement at Powhatan Creek with an activities director that schedules classes, plans trips and events, oversees clubs, and organizes interest groups. The Resident's Club is the hub for all social events at The Settlement. Whether you prefer to partake in fitness classes, crafts, or games there is a group or club guaranteed to spark your interest. Residents can attend yoga class in the exercise studio, make crafts in one of the hobby rooms, or challenge neighbors at billiards. The Settlement at Powhatan Creek is located in Williamsburg, Virginia. It s conveniently located just south of Monticello Avenue. With excellent golfing, shopping, dining, and recreational opportunities, it s easy to see why CNN s Money Magazine named Williamsburg one of the best places to retire. Golf enthusiasts can schedule a tee time at Williamsburg National Golf Club, just five minutes from The Settlement. Additionally, Williamsburg Premium Outlets is just fifteen minutes away for superior shopping. Also just minutes away is New Town Shopping Center which provides 300,000 square feet of shopping, dining, salons, fitness centers, day spas, a movie theater, and other personal services. There is no doubt that The Settlement at Powhatan Creek is the ideal location in Williamsburg for today s active adult. The Resident's Club - 15,000 Sq. Ft. There are plenty of activities available in The Settlement at Powhatan Creek. Here is a sample of some of the clubs, activities and classes offered here. The low-maintenance townhome floor plan that is provided by Ryan Homes is ideal for today's active adult. At 2,229 square feet these two-level homes feature three bedrooms, two bathrooms, and an attached two-car garage. There is an owner's suite on the main level and additional bedrooms on the upper level for guests. The master suite features a large walk-in closet, dual vanities, and natural lighting. The lower-level area also provides plenty of storage options. Ryan Homes offers four different single-family floor plans that feature at least three bedrooms, two bathrooms, and an attached garage. These single-family homes feature first-floor master suites and plenty of storage space. Manor Homes built by Wayne Harbin Builder, Inc. are available on a resale basis at The Settlement at Powhatan Creek. These single-family homes provide larger living spaces for homebuyers looking for size. These spacious homes have first-floor master suites with additional bedrooms on the second level. The manor homes feature at least three bedrooms, three bathrooms, and an attached garage. Townhomes by Wayne Harbin Builder, Inc. are spacious attached homes offered on a resale basis. These well-appointed homes feature at least three bedrooms, three bathrooms, and an attached garage with master suites on the first floor. Low-maintenance cottage homes by Wayne Harbin are single-level homes. These homes feature at least two bedrooms, two bathrooms, and an attached garage. Many homes have beautiful foyers and some have unfinished basements. Fantastic location, exceptional homes and wonderful amenities. The Settlement is a great neighborhood! We purchased a home here in 2010 and every year the community gets nicer as more homes are built. The Triangle is an amazing historic area, we've lived here for years and love it. 55places.com is not affiliated with the developer(s) or homeowners association of The Settlement at Powhatan Creek. The information you submit is distributed to a 55places.com Partner Agent, who is a licensed real estate agent. The information regarding The Settlement at Powhatan Creek has not been verified or approved by the developer or homeowners association. Please verify all information prior to purchasing. 55places.com is not responsible for any errors regarding the information displayed on this website.